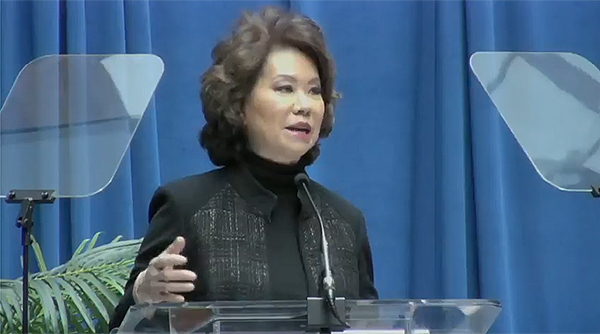 WASHINGTON — Updated federal guidance for manufacturers and states seeking to deploy self-driving vehicles could be released as early as summer, U.S. Transportation Secretary Elaine Chao told hundreds of executives attending the automated vehicle policy summit here. The new policy, to be called AV 3.0, will specifically address automated policy guidance for trucks as well as cars, rail and mass transit, Chao told some 400 executives. Chao listed public concerns about the security and privacy of automated technology along with the potential for hacking. Chao said policy makers are also studying how new technologies may impact the workforce. There is widespread interest in automated technology; Chao said that AV 2.0 — the current federal guidance issued in September of 2017— was the most-viewed DOT policy document posted on the agency’s website. “Since it was released, only six months ago, it has been downloaded more than 125,000 times,” Chao said. The summit also included expert panelists from across transportation. One day removed from being sworn in as administrator of the Federal Motor Carrier Safety Administration, Raymond Martinez said automated trucks could save “thousands and thousands of lives,” and also hold potential to benefit the economy. One of those challenges is the truck driver shortage and the perception that trucks will soon be driving themselves, said Chris Spear, CEO of American Trucking Associations. Spear urged all transportation modes to listen, do homework, get out in the real world, and visit automated vehicle test sites and software developers. Panel moderator Marjorie Dickman, associate general counsel at Intel Corp., said Intel estimates automated vehicles could save 500,000 lives between 2035 and 2045, when it projects that half of the vehicles on U.S. roads will have some level of automation. Meantime, Dickman said consumers must learn to trust the new technology’s safety, the vehicles must be affordable, and governmental policies must prioritize safety but also remove barriers to innovation. Steven Bradbury, DOT general counsel, said AV 3.0 will focus on all surface transportation modes. Regulators should not attempt to “reinvent the wheel” with new regulations, but rather adapt current regulations to new innovations, he said.